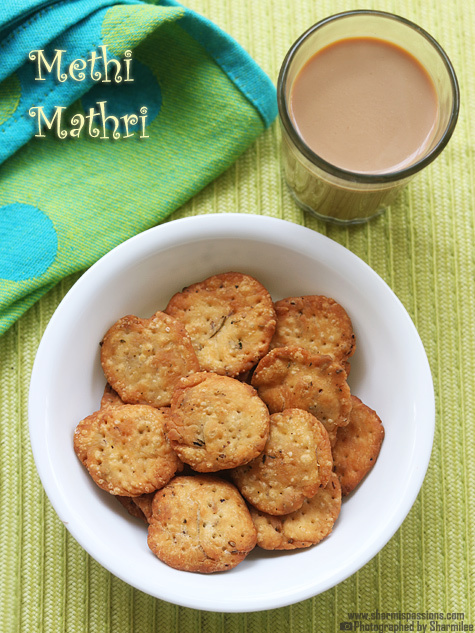 Methi mathri recipe with step by step photos.Mathri is a kind of flaky salted crackers from north west region of India. 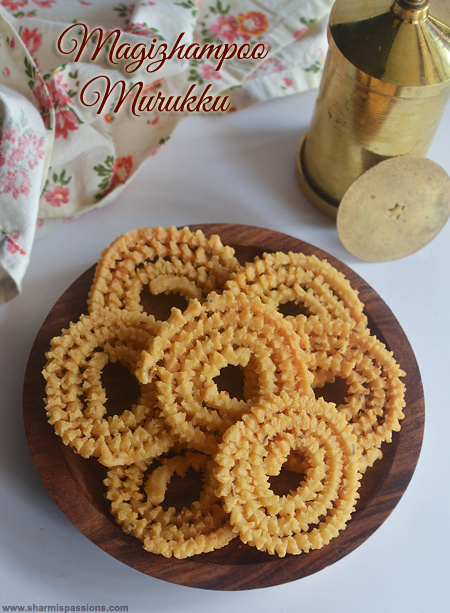 Mathri is one of the most popular snacks in North India, especially for marriages,religious occasions or festivals like Karwa chauth,Diwali etc. 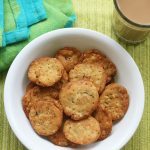 Methi mathri recipe is just the addition of dried methi(kasoori methi) to the plain mathri dough.It is very flavourful and tasty. 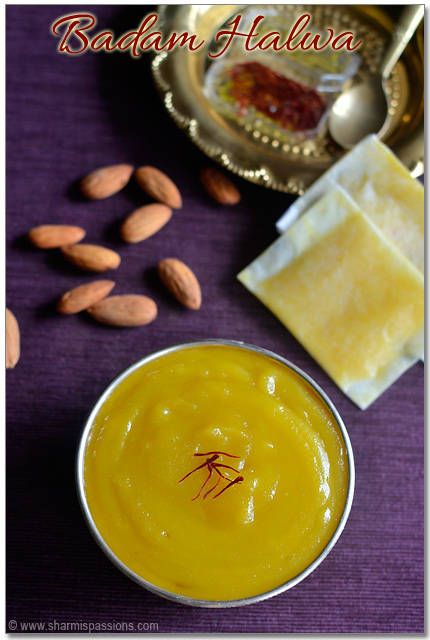 I loved to have methi mathri with my evening tea but traditionally mathri is served with mango pickle. 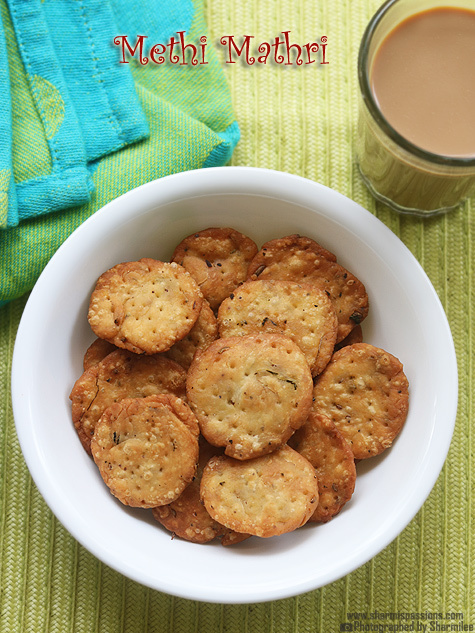 These crackers have a flaky inside with a crisp outside,making it an ideal snack to munch with tea. I first tried it few days back but did not get crispy mathri,had no clue where the mistake was but again tried the next day and yes got perfect mathri.The key to get flaky crispy mathri is to cook in low flame. 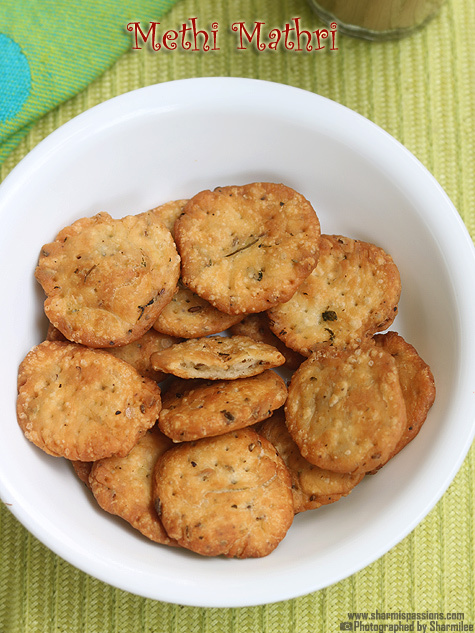 Crispy and flaky methi mathri ready to enjoy with a cup of chai! 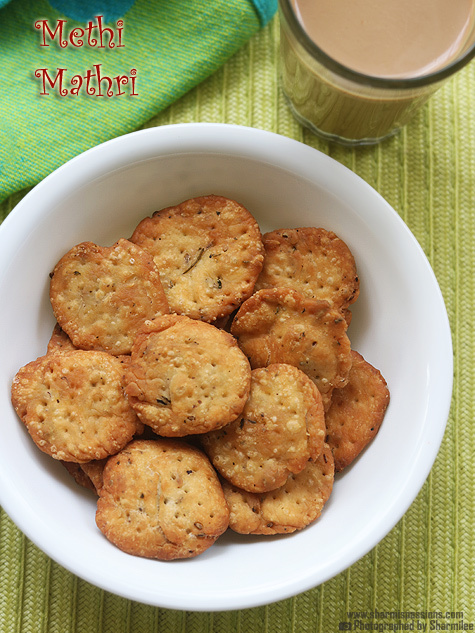 Mathri is a indian spiced salt crackers made with white flour flavoured with methi,ajwain jeera and black pepper. 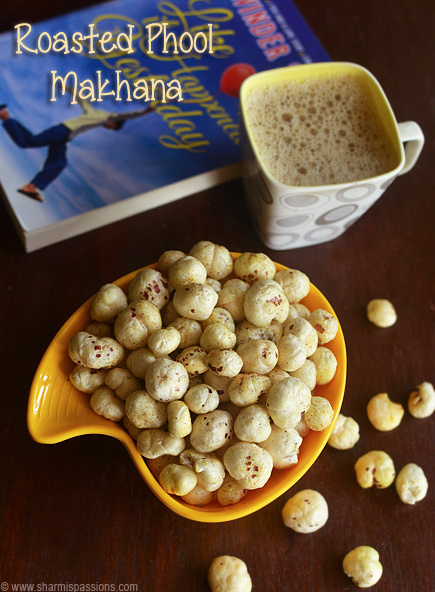 In a mixing bowl take white flour,add ajwain,jeera,salt,pepper powder,dried methi and ghee. First mix well with your fingers. Add water little by little to form a smooth dough.Set aside for 15mins. Now pinch and divide the dough into small equal potions.Place each portion on your palms to make a ball first.Then slightly flatten it, it should not be very thin.Don't worry if it doesn't form a perfect circle, thats how a mathri should be. Then prick with a fork on both the sides.Likewise finish off the entire dough.Heat oil in pan, don't heat it smoking hot.When you put a pinch of dough in heated oil it should slowly come up,thats the right temperature.Add 3-4 matris. Cook in low flame,flip and cook. Cook till golden.Drain in tissue paper and store in a clean dry container. Don't be in a hury while deep frying.Cook in low flame with patience,flip over and cook in low flame till golden.This is the key to get perfect crispy flaky mathris. If you deep fry in high flame, then it will turn golden brown immediately but may not have cooked inside. Do not overcrowd while frying,just 4-5 will be ok,depends on your kadai size too. Mathris are usually not smooth as they are shaped with hands.Don't pat it too thin, it should be slightly thick atleast 1/2 inch thickness. The dough be tight more like poori dough so be careful while adding water. 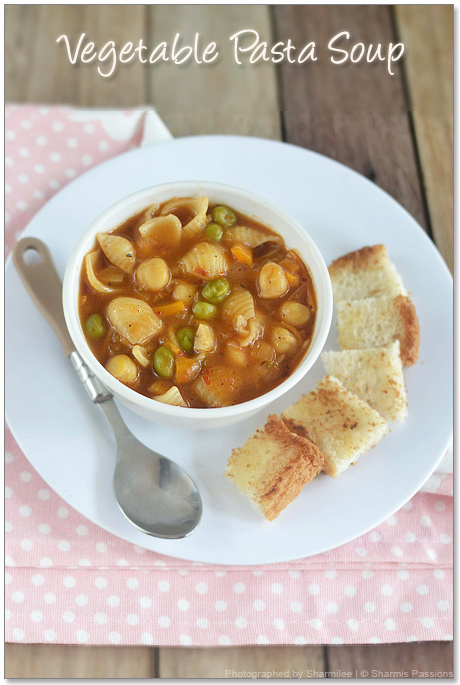 You can also add 2 tbsp fine rava along with flour. Now pinch and divide the dough into small equal potions.Place each portion on your palms to make a ball first.Then slightly flatten it to around 2 inches in diameter, it should not be very thin.Don’t worry if it doesn’t form a perfect circle, thats how a mathri should be. Then prick with a fork on both the sides.Likewise finish off the entire dough.Heat oil in pan, don’t heat it smoking hot.When you put a pinch of dough in heated oil it should slowly come up,thats the right temperature.Add 3-4 matris. Cook in low flame,flip and cook.It will take atleast 5-7mins to get the golden color in low flame. 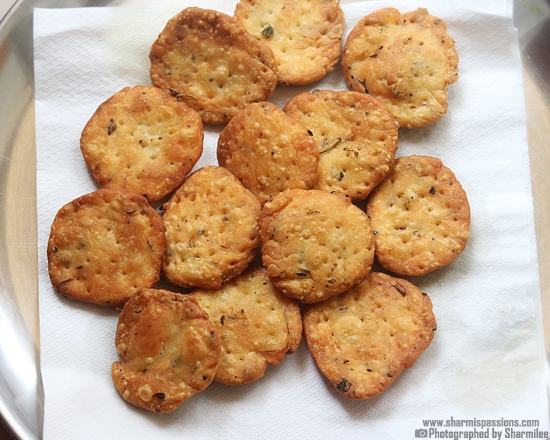 Mathris are crispy and flaky and keeps well in room temperature for atleast a month. 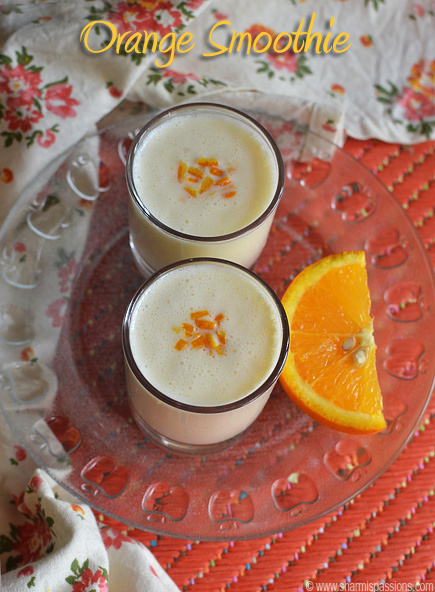 Looks yumm!! 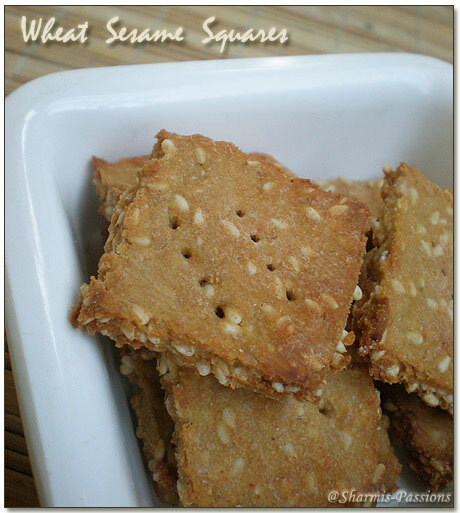 !can we use whole wheat flour or a mix of atta and maida in this ? yes you can but the texture will be slightly different.